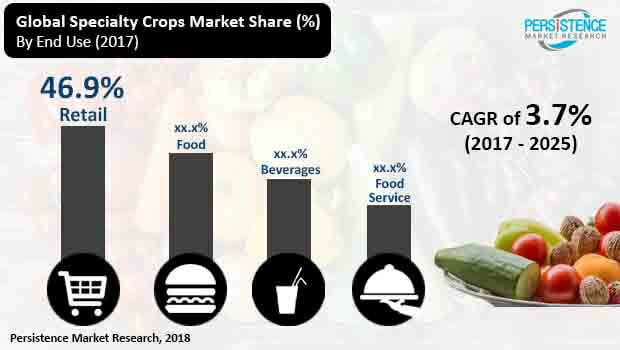 Specialty Crops Market Segmented By Nature – Organic, Conventional; Type – Fruits, Tree Nuts, Vegetables, Herbs & Spices , Others (Medicinal Herbs); End Use – Food (Bakery, Confectionery & Snacks, Soups, Sauces & Dressings, Dairy Products, Breakfast Cereals & Infant Food, Others), Beverages (Juices, Nectars & Fruit-based drinks, Carbonated Drinks & Energy Drinks, Others), Food Service, Retail. The Internet, e-Commerce, and online stores, along with review sites are making it easy for consumers to compare specialty crops and price levels, along with the origin of the crop and details of the manufacturer or supplier. This accessibility to information and relevant details is resulting in a more transparent specialty crops market. As a result, a growing number of consumers are opting to make purchases of specialty crops through this channel, once they are satisfied with the available information. Online retailers are offering a wide variety of products to consumers through comprehensive product information, which also covers international brands. Furthermore, online stores offer specialty crops based products at competitive pricing, along with other lucrative offers or coupons. All these benefits together are expected to act as positive aspects boosting the growth of the specialty crops market over the forecast period. In addition, the convenience associated with easy access and payment options for free home delivery, online purchases, and return or exchange policy, are some other dynamics playing a pivotal role in influencing the overall outlook of the global specialty crops market. With the emergence of contemporary retail formats, a new type of operation in the form of food courts and specialty stores in large format malls has emerged. These food courts and specialty stores offer consumers easy access to food and beverages at the time of shopping and entertainment activities, and also offer a choice of selecting different products by comparing them then and there. Moreover, the retail format nowadays offers a wide variety of products to consumers through detailed catalogues, which cover international brands as well. This amended retail format also offers tree nuts and dried spices at a very competitive pricing, along with other lucrative offers. These improved retail formats have enabled companies to offer their specialty crops to consumers in a better and more efficient manner. Consumers can now easily select their desired crop from a vast variety of specialty crops, which are made available in stores in such malls. All these benefits together are expected to act as positive factors driving the growth of the global specialty crops market. The trend of consuming natural healthy food is expected to continue steadily, as the preference for healthier and premium alternatives such as smoothies, breakfast cereals, seeded bread, and other bakery products with natural ingredients is increasing, thereby supporting the growth and demand for specialty crops as well. According to a survey held by the World Health and Wellness Council, Latin America witnessed a 16% increase in the healthy category, with healthy fruit drinks and plant source as the highest growing categories between 2012 and 2014. Moreover, the demand for organic vegetables and fruits is growing among consumers in the Latin American region. Organic food products are stated as healthier and beneficial in comparison to conventional foods. This awareness is increasing owing to the rising penetration of the Internet and smartphones in the region.